I used the new Scallops Textured Impressions Embossing Folder for the Pear Pizzazz background panel. Very cute, don't you think? The new Banners framelits make cutting the different sized banners a cinch. You don't have to think about what dimensions to make your cuts and worry about making the flag ends centered and even. The new stamp set Petal Parade, from the Sale-A-Bration Brochure, is one that you're going to want to earn with a $60 order. 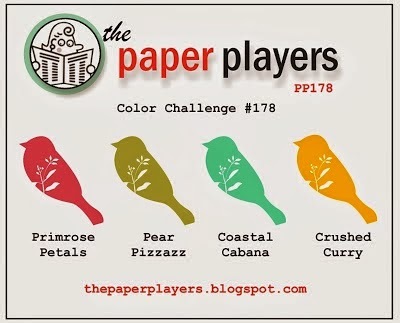 I used 3 of the challenge colours on the images from that stamp set. The sentiment is from Happy Congratulations, a new Occasions catalogue stamp set, stamped here with StazOn Jet Black ink. I'll bet you can hardly wait to get your hands on that coloured twine from the Sale-A-Bration brochure. It comes with Sweet Sorbet Accessories which include two other colours of the twine and some cork flower stickers. Speaking of Sale-A-Bration, this would be a good time to host your own workshop with me. Your guests will be more motivated than ever to purchase in order to win the Sale-A-Bration giveaways and you will get a chance to earn $40 MORE free product from Stampin' Up! if your party sales (before tax and shipping) are $400 or more. During Sale-A-Bration, that's not hard to do. It can be your place or mine (I do all the cleaning and baking at my place), all you need to do is invite your friends for a Creative Night Out! I am booking in February and March now, so call or email me if you want to maximize your Sale-A-Bration benefits. Wow!! Love the colorful card! Thanks, Laurie. I checked out your blog and I love your work! I saw a CAS design that I might CASE for my next Quick and Cute class! Thanks for sharing! Thanks so much, Kim. I made a quick visit to your blog and love the Thank You card you created! Thanks, Ann! It was a highlight of Leadership for me to meet you! Lovely card, Heather....those banners get me every time, I just think they are so cute & trendy right now! Thanks so much for playing with my color challenge this week!